Our society is not one that readily embraces the idea of sacrifice. There is little recognition of the profound benefits of self-denial and of giving completely of oneself to others — and to God. All the more reason, then, for us as Catholics to actively live out the ideals of the penitential season of Lent. One way to prepare ourselves is to better understand the roots and symbolism of the season and the day that starts it all: Ash Wednesday. The name of Lent comes for the Old English word for spring. In most other languages, the name of this season is derived from the Latin term “quadragesima,” or 40 days. The length of the season is one of its most symbolically important aspects, putting us in continuity with figures throughout salvation history who experienced penitential periods of 40 days. Biblically, the number 40 is associated with discipline, preparation and asceticism. During the great flood, it rained for 40 days and 40 nights (Gn 7:12) and after the waters had been receding for some time, “at the end of 40 days” Noah sent a raven out to test the waters (Gn 8:6-7). Moses was on the mountain with God for 40 days (Ex 24:18, 34:28). Elijah traveled for 40 days before reaching the cave where he had his vision (1 Kgs 19:8). Nineveh was given 40 days to repent (Jon 3:4). And, most directly related to our liturgical celebration of Lent, Jesus spent 40 days in the wilderness fasting and praying before beginning his public ministry (Mt 4:2). The Catechism of the Catholic Church sums up the season of Lent: “By the solemn 40 days of Lent the church unites herself each year to the mystery of Jesus in the desert” (No. 540). This union comes not simply from the length of the season; it is from the three pillars of Lent — praying, fasting and almsgiving — by which we live out the example set by Jesus and prepare ourselves to celebrate the paschal mystery of his death and resurrection. Ash Wednesday is one day in particular in which we unite ourselves to the ascetic fasting of Jesus Christ. Appropriately, as it is the beginning of the season, Ash Wednesday is a sort of Lent-in-microcosm. What significance do the ashes themselves hold? 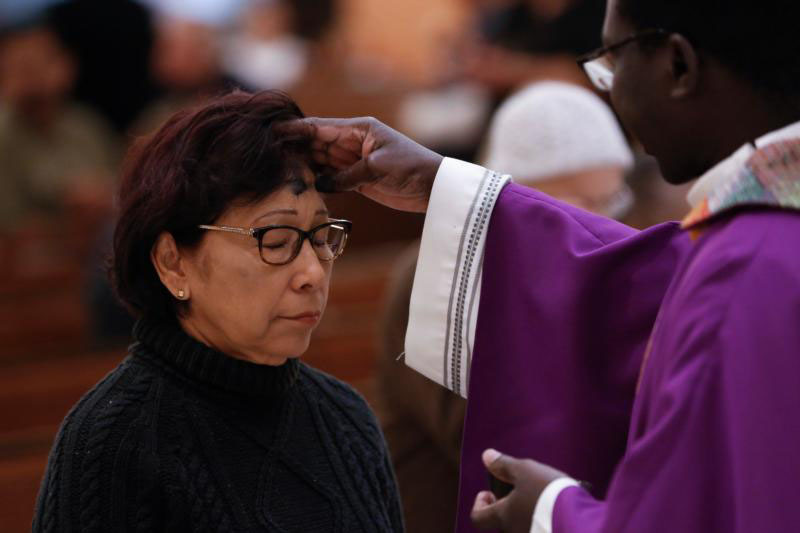 Why do we engage in this ritual each year, and what does it have to do with Lent? There are two primary symbols with which we often associate the ashes. First, in the Bible a mark on the forehead is something that signifies ownership. This tradition was retained in the early church after the resurrection, as the early Christians would make the sign of the cross with their thumbs on their foreheads, indicating their complete gift of self to Jesus Christ. Similarly, the forehead is marked with the sign of the cross at baptism, in confirmation and at every Mass prior to the proclamation of the Gospel. Signing the forehead with ashes is one more reiteration of this ownership. Second, and perhaps more widely recognized, ashes are biblically a sign of mourning and penance, as well as death. There are countless scriptural examples wherein someone will express their penitence and seek forgiveness by covering themselves in sackcloth and ashes. Eusebius of Caesarea (circa 260-339), in his “Ecclesiastical History,” tells of an apostate named Natalis who came to Pope Zephyrinus seeking the pope’s forgiveness — clothed in sackcloth and ashes. Ashes were also sprinkled on the forehead of one who was to do public penance, as they left confession. This outward sign of an inward reality increased in prominence as time went on. The first part recalls what God said to Adam when he and Eve were being expelled from the garden (Gn 3:19), and Abraham’s declaration: “I am only dust and ashes” (Gn 18:27). It is a profound reminder of the reality of death. This phrase is a strong reminder of our mortality, a reminder that the things of this world are fleeting, and that we are ultimately meant for the kingdom of God. According to Father William Saunders, former professor at Notre Dame Graduate School in Alexandria, Virginia, this ritual is one that dates back at least to the eighth century, in the earliest extant editions of the Gregorian Sacramentary, a collection of prayers and other liturgical texts. Lent is not merely a preparation for Easter. On Ash Wednesday, we sign ourselves as disciples of Jesus Christ, and we strive to live the following 40 days so that the world knows we are Christians.